If your home is constructed of wooden materials, then you need to be very careful about the structural parts of the wooden house. Termites will take no time in destroying your beautiful wooden home. What precautionary measures you need to safeguard your house from termites? Get the answers and solutions from our pest control company. People these days are opting for wooden flooring which indeed gives a unique appearance to a person’s home. If your property is built in the pest-prone area, then you need to be alert at all times, as termite infestations could cripple your property. Termites are the nasty critters which destruct cellulose items. The presence of cellulose in the wooden flooring of your house will become the feeding item for termites. Termites not only choose the cellulose items for feeding, but also the critters prefer to make nests inside the wooden stuffs. If you have not pre-inspected your property or you have constructed your home in a property where the breeding of termites is high, then the chances of getting your home affected are also high. Termites reside with their colonies. As termites start developing, these critters move around from one place to another. It is not easy to detect termites, as these critters are white in color, look like ants and live in the foundation of your home or deep inside the wooden-based materials. Getting rid of termites is essential for your home. All you have to do is to dump the local pesticides and hire a professional to get your property regularly treated from termite infestations. The basic and imperative part of termite treatment is the inspection. Get termites pest inspection Brisbane service from our pest control company to erase the existence of termite pests. We lay emphasis on the inspection part which is done by our efficient pest inspectors. Our pest inspectors search inside and outside of your place to find the colonies of termites. We opt for family-friendly solutions which would not harm your health and home. What would happen if termites breed in your place? The infestation of termites may not lead to drastic health issues. But, the infestation may cause allergic reactions in people who are prone to allergies. Your house and cellulose items are highly prone to termite infestations. Termite specie which live under soil affect the foundation of your home by infesting deep inside the foundation. It is through the foundation the termite specie will get into your home. Another specie of termite builds home inside wooden materials. In our timber pest inspection Brisbane, you will get to know which termite specie feeds on wood and under soil. Termite pesticides will be available in the market. Before you apply, you should first know the termite species that are always active in your surroundings. If you are living anywhere in Australia or in Brisbane locations, the termite species which are invading your zone will probably be subterranean termites, drywood termites, dampwood termites, conehead termites, formosan termites and desert termites. Not all termite species will live under soil. The harbourage areas might be different for all termite species. 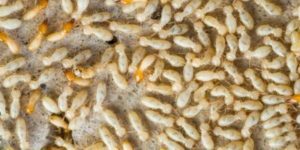 When our pest technicians will come to implement termite treatment Brisbane solutions in your property, then they will discuss with you about each termite specie. Are termites thriving in your property? Termites are thriving in your housing territory and you have no idea about it. You come to know of termite breeding when a full-blown infestation has already occurred at your place. Knowing some infestation signs in advance could prevent you from future hazards. Tubes made up of soil are found to be noticed near attics, windows, damp places and close to chimneys and on the pipes. Hollow sounds on the beams of wood and piles of wooden dust on the floor would suggest you of termite infestation. Peeling of paints from the wall is another sign of having termites in your home. Tiny pellets are found right next to the infestation spots of termites. Wings of termites are found to be spotted at various places of your indoor zone. Can termites be killed with local pesticides? Browsing through internet, you can get information on various termiticides which would claim to eliminate termites. Upon having applied those termite-based pesticides at your place where you suspect to have infestation might eliminate termites from the surface. But, it is necessary to eliminate termites from the roots if you want to get shot of the infestation for a long time. How will you eliminate the infestation which is in the unreachable places? A professional help in exterminating termite infestations will prove to be effectual. Our pest inspectors are highly trained in termites pest inspection Brisbane techniques. Our pest inspectors have license and years of experience which would ensure you that you will be provided with top level of pest solutions from our pest control company. Our pest officers will find different options to exterminate termites from your existing zone. Our pest inspectors will walk through your property to see the probable breeding sites of termites. Whether it is your residence or office, every nook and corner of your place will be inspected by using appropriate inspection tools. Every reachable and unreachable zones will also be checked to find out the exact spots of infestation. Upon locating those spots, our pest inspectors will assess the level of infestation and to what extent the infestation has reached. The motto of our timber pest inspection Brisbane is to erase the existence of termite pests from your place. Our inspectors will also provide you some useful tips which would help you keep the infestation in check. We implement top quality and enviro-friendly termite treatments on the breeding points, so that the creepy crawlies do not disturb you again. Is our pest treatment affordable? Our pest treatments are accessible at the rate which would not seem to be expensive for our clients. Get our cost-effective termite treatment Brisbane measures to avert dangers of termite invasion in the long run.